My body suffers from dry skin, whereas on my face I have combination skin: dry cheeks and an oilier T-zone (across the forehead and down the nose). I hate having dry skin: The way it feels - tight, the way it looks - white patches of flaky skin, the way it itches, and the way it makes my skin crack and bleed all by itself - especially in the winter. Dry skin also accelerates the aging process and encourages wrinkle formation. Horrible. Which is why Moisturising is a Must! I love using Olay products for my face. I've just finished my 50g Olay Total Effects pump and I was looking for a replacement. I found this at the grocery, which came with the little pump free! I've wanted to get 2 moisturisers: 1 with SPF and 1 without (for nights out and pictures), and this deal was just what I needed. 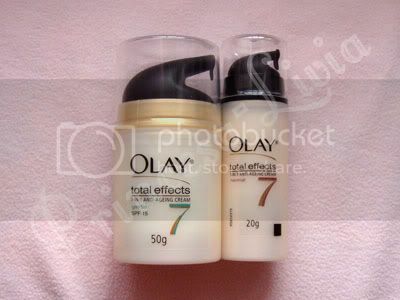 I haven't tried the Olay Total Effects in Gentle as my previous one was in Normal, so I'll try to review it once I've used it more. 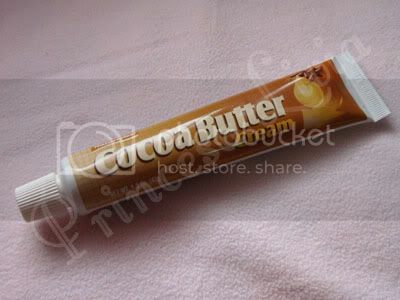 My mom gave me a tube of Cocoa Butter cream since she stocked up on it when she went to America! I've never tried this before, and I was pleasantly surprised. It smells really tasty - a lot like my Tutti Dolci body cream in Creme Brule, but I don't recommend eating it of course. It dries quite quickly and it leaves your skin so smooth and soft. I apply body lotion after I've towel-dried myself from the shower. I find that the lotion is quickly absorbed into my skin during this time and effects last for most the day depending on your moisturiser. Like with the body lotion, I find that the face cream is more easily absorbed on damp skin just after cleansing. In addition to these, I get random bouts of dryness, especially with my hands from washing them frequently. When this happens, I just apply moisturiser as needed. Note: In the UK with the dry air and cold wind, I religiously stick to this routine, even in the summertime. However, in more humid environments such as here in the Philippines and I tend to use moisturisers less since my skin tends to break out with spots. I have dry skin on my body too, and I use Vaseline lotion and it works really well. Another thing I do is shave using conditioner to keep my legs soft- that really works! On my face, I use EVOO (extra virgin olive oil) to keep my face moisturized and it is amazing. You just have to read the reviews on MUA to know that. Thanks Luinae! Those tips are amazing. I've never thought of using conditioner to shave with and EVOO on my face as a moisturiser, though I use it as a makeup remover when I wear waterproof mascara. But I'm curious, won't EVOO cause breakouts? Products that contain petroleum jelly are also amazing to use on the body, just not for the face as that can cause breakouts as well.